Tried and true recipe for a great time: a dash of warm weather, a heap of live music and plenty of good friends. 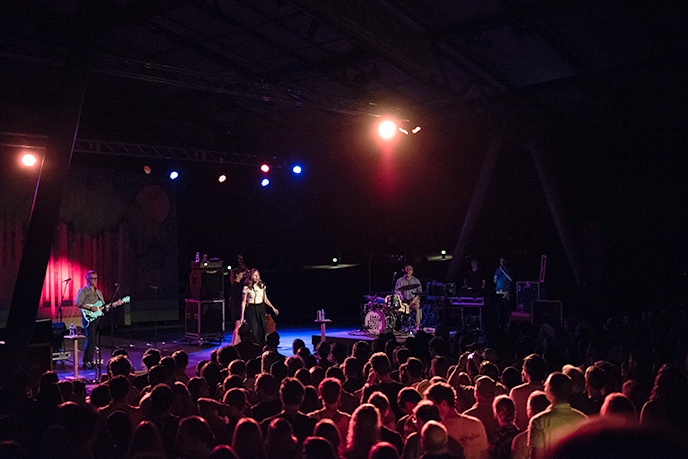 With the most live music in N.C., Raleigh knows how to rock the summer. 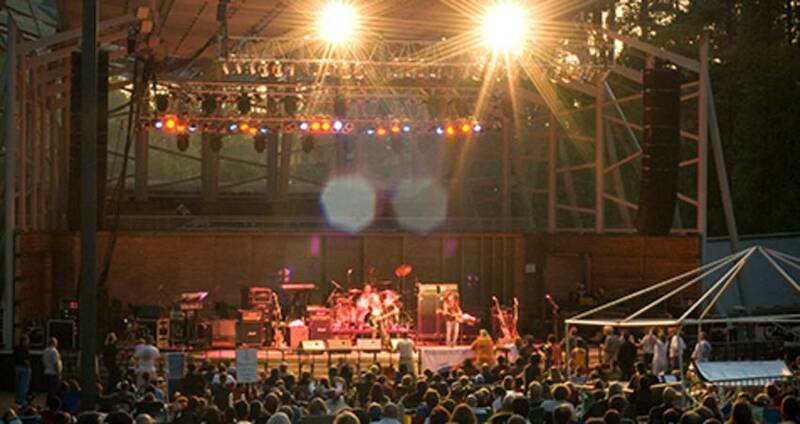 The area&apos;s outdoor concert venues hit all the right notes when putting together the schedule, bringing in plenty of big-name acts plus a bevy of artists with loyal followings ready to hit the stage in the Raleigh area. With a jam-packed schedule of open-air tunes, we&apos;ve put together your guide to the venues and concert series that make up more than 100 outdoor concerts in Raleigh, N.C., this summer. These weekly, alternating, free outdoor concert series happen in downtown Raleigh&apos;s City Plaza every Thurs. from June 2 through Aug. 1. Altogether, the two series feature 14 consecutive weeks of pop, country, rock and hip hop music from N.C.-based bands (Oak City 7) plus the best of bluegrass and traditional music around (Pickin&apos; in the Plaza). More than 50,000 attendees come out each summer to take in the music, plus the local beer and food trucks onsite. This 5,500-seat venue that sits in the shadow of downtown Raleigh&apos;s skyline has a major lineup planned for 2016 with more than 20 shows scheduled through the end of Aug. You can catch Ellie Goulding (6/10), Of Monsters and Men (6/15), 311 and Matisyahu (7/24) and Phillip Phillips (7/31), plus plenty more. Big crowds, big acts, and big tailgating. Coastal Credit Union Music Park at Walnut Creek has long been known as a can&apos;t-miss stop for music stars as they tour the Southeast, and this summer brings Miranda Lambert (6/10), Florida Georgia Line (7/14), Dierks Bentley (7/22), Luke Bryan (9/2-3), Jason Aldean (9/30) and more big-name country music, pop and hip hop acts. 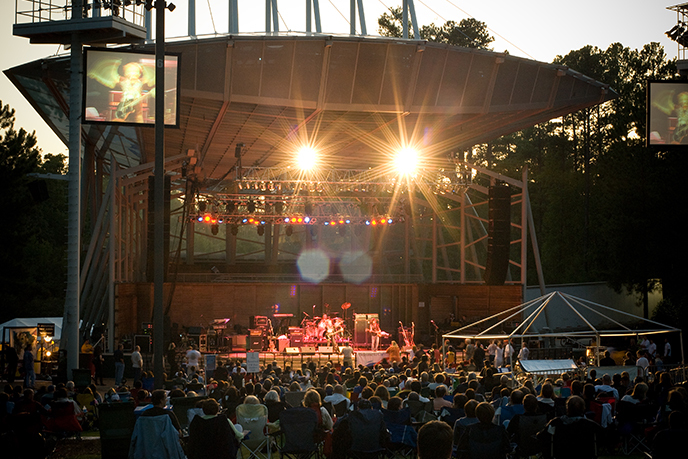 Nestled in a landscape of tall pine trees and next to the beautiful Symphony Lake in Cary, Koka Booth Amphitheatre has nearly 20 jazz, bluegrass, symphony and indie music shows lined up for the summer season, including a free show with fireworks on July 4 that you won&apos;t want to miss. A few highlights: Modest Mouse and Brand New (7/6), ZZ Top (9/14), The Lumineers (9/15) and Alabama (10/7), plus Summerfest: The Music of David Bowie (6/25) where the North Carolina Symphony explores the incredible range of David Bowie&apos;s music. The weekly Thurs. evening Midtown Beach Music Series at North Hills is now in its ninth year. The series, which is in full swing for the spring and summer through Aug. 11, attracts lively crowds, with more than 125,000 guests attending throughout the 17-week season and including some of the best shag dancers around. This year&apos;s line-up includes The Tams (6/30), The Fantastic Shakers (7/7), The Embers featuring Craig Woolard (8/4) and other popular beach music artists. This unique performing arts and film venue—a work of art in itself—hosts an outdoor summer series featuring a range of musical performances, family entertainment, blockbuster movies and classic films. On the music front, you won&apos;t want to miss the likes of Edward Sharpe & The Magnetic Zeros (5/27), Lake Street Dive (6/10), Eileen Ivers (7/30) and Iron and Wine (8/13). This Town of Cary venue located inside of Bond Park is home to free concerts presented by PineCone, Piedmont Council of Traditional Music. At Sertoma Amphitheatre this summer you can catch Americana songwriting duo Laura Wortman and Kagey Parrish of The Honey Dewdrops (6/11), Baltimore-based roots group Charm City Junction (8/13) and more. 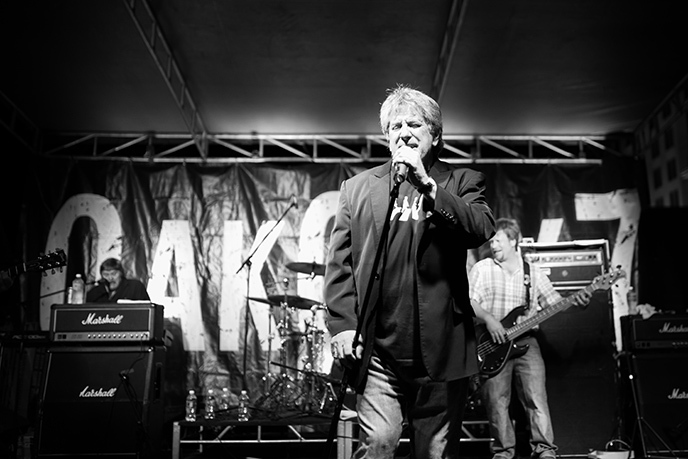 This new, free music series in downtown Wake Forest takes place on the second Fri. of each month through Sept. 9, featuring bands that play rock &apos;n&apos; roll covers from classic to modern rock. Bring blankets and lawn chairs, plus a little bit of cash if you&apos;re inclined to indulge a local beer or two, provided by White Street Brewing Company. This lively series of free concerts featuring musical styles from near and far takes place on select Fridays in the beautiful gardens of the Page-Walker Arts and History Center in Cary. Bring the family plus a picnic to check out Craicdown (6/10), Lounge Doctors (7/8) and more. For a full calendar of music happenings in Raleigh, N.C., (indoors and out) check out themostnc.com.